A severe drought in Mexico has revealed a 400-year-old Dominican church that has remained almost completely intact despite spending decades submerged under water. Drone footage of the submerged church sitting in the Benito Juarez Dam in Jalapa del Marquez, Oaxaca, was captured on Monday. Local tour guide and fisherman Miguel Oliveira said the temple was built in worship of the Virgin Mary in the late 16th century. "This temple is believed to have been built between 1550 and 1600. Here was venerated the virgin Mary of assumption. She is the patroness of Santa María Jalapa de Márquez," Oliveira said. The temple, flooded in 1962 in preparation for the dam, partially re-emerges every year when rainfall subsides and temperatures rise, lowering water levels. 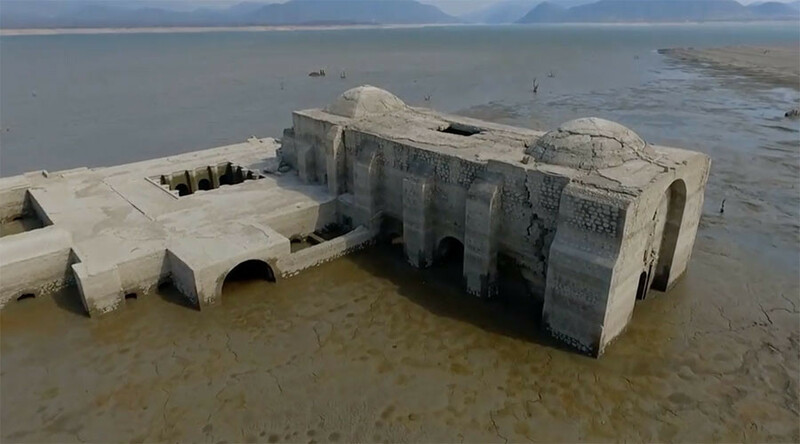 In 2008 a critical drought uncovered the church completely, for the first time in the nearly 50 years the temple has been underwater, reports La Silla Rota. However, this year a severe drought reduced the dam’s water to just 16 percent of its 947 cubic hectometer capacity and uncovered the church almost completely, according to the National Water Commission.